Columbia Nashville’s Bradley Gaskin recently debuted his single, “Mr. Bartender” on the Grand Ole Opry. Gaskin wrote the song several years ago while working for a drywall company in Alabama. ASCAP songwriter Jordan Beckett and actor/director/filmmaker Sam Jaeger recently stopped by the ASCAP Nashville office. Beckett’s band, Bootstraps, provided the soundtrack to the feature film Take Me Home, which was written, produced and directed by Jaeger. The film is screening and winning awards at several film festivals across the country. In addition to Take Me Home, Bootstraps’ music has also been featured on the TV show No Ordinary Family and will be heard in several TV shows and films later this year. BMI hosted a panel discussion on June 28 for Y.E.P.— Young Entertainment Professionals—a new industry networking group created in January by Andrew Cohen, an alumnus of BMI’s Belmont University internship program, Catalog Cast. The panel provided an informal setting for rising music industry staffers to pick the brains of industry experts in a relaxed, after-hours setting. While touring the country in support of his recently released country/western solo debut on Sugar Hill Records, internationally celebrated musician Nick 13 stopped by the Country Music Association offices in Nashville to pledge his membership. (L-R): Christopher Seay, Membership & Balloting Assistant; Betsy Walker, Sr. 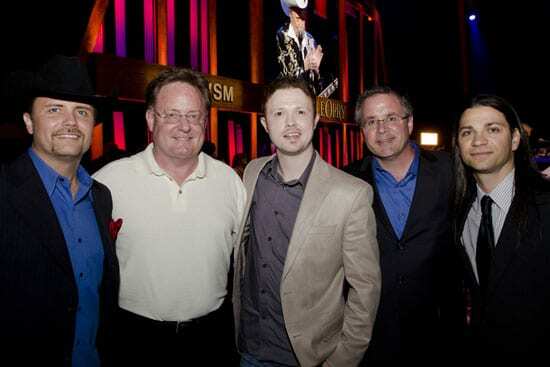 Coordinator Member Relations & Services; Nick 13; Bob Doerschuk, CMA Close Up Editor; Gary Paczosa, VP A&R for Sugar Hill Records.